After Mass at Oxburgh Hall, we had breakfast in the village hall. 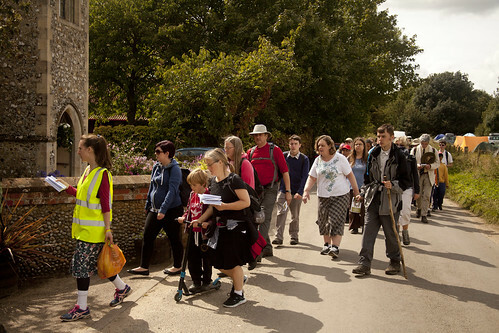 As usual our catering team had set up there ahead of time, in order to provide us with not only tea, bread and jam, and cereal, but porridge, now established as a Walsingham Pilgrimage tradition. And so we walked on, to Harpley, where the village hall there was the venue for our evening meal. 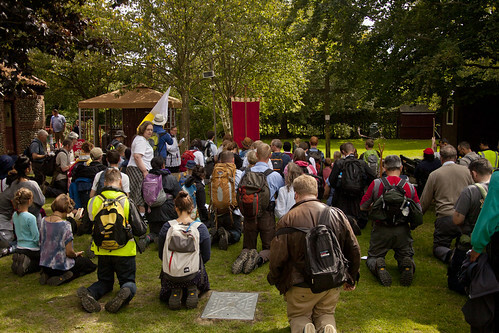 Again, throughout the pilgrimage the catering team provided us with freshly cooked, hot meals. On the Saturday evening it was a sausage casserole with couscous. 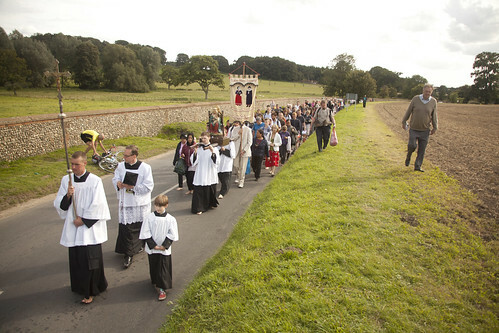 On the final day our walk is shorter: we arrive at the Catholic Shrine at about 1pm. 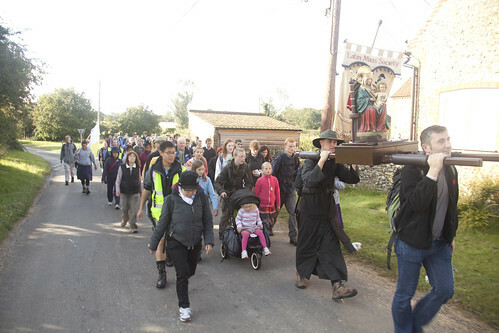 During this day's walk we carry the processional statue of Our Lady of Walsingham, which can also be seen on the procession during the Oxford Pilgrimage in October. We file into the shrine complex, and after a prayer to Our Lady (above), we have a break to prepare for Mass at 2pm in the Reconciliation Chapel (below). 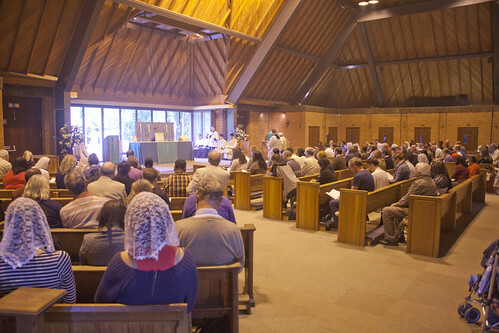 This chapel is always a challenge for photography; on a sunny day like last Sunday the sanctuary is very strongly lit from the back, with large plain-glass windows, and with remarkably orange tungsten lights shining from the ceiling. 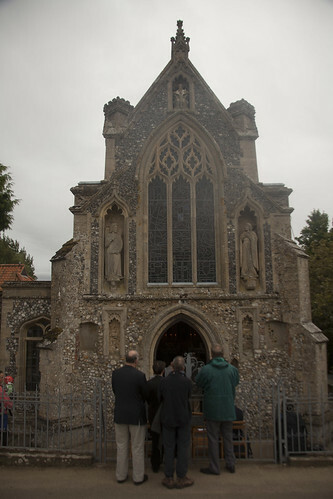 It is said that the design was inspired by Norfolk barns. If you want to know what they look like, there one here. 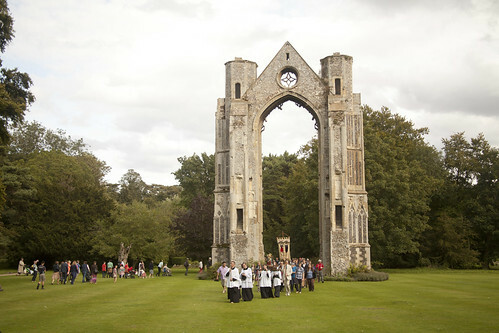 At Mass we picked up the coach and car pilgrims, and a large number of people who were in Walsingham independently. There were a good number from Youth 2000, for example, including a lot of Irish Travellers. We had a congregation of about 300. With a considerable crowd, therefore, we processed after Mass to the Priory, venerated the site of the Holy House, and had our final devotions and blessing from Fr Cahill. For those staying overnight, we had a sung Mass in the Slipper Chapel, the centrepiece of the Catholic Shrine, where the shrine image is to be found. It is tiny, but we spilt out into the area around the door, and brought in as many chairs as possible.